HILLSBOROUGH COUNTY, Fla. — When students started a new school year Friday, they may have noticed improved security measures on campuses across the district. “We don’t take a day for granted. We know we’re responsible for, you know, people’s most precious things, which are their kids,” John Newman, Hillsborough County Public School Chief for Security and Emergency Management, said. Districts across the state had to comply with a new public safety law, which requires them to have an armed first responder at every school. Hillsborough County Public Schools decided to enhance their security force to abide by the new law. This is in response to the tragic shooting in Parkland last school year. As security officers are trained, they will replace sheriff’s deputies and police officers at elementary and charter schools. So far the district has hired 51 security officers. They have to hire more than 100 additional security officers. The district said it is a long process because there are limited spaces for the training classes. “We know what the responsibility and the lift is, and we’re willing to accept that responsibility, but I think about it every second,” Chief Newman said. While there are several enhanced security measures, authorities are keeping some of their plans a secret. “We want to assure parents that we’re thinking of everything possible to create a safe environment on campus for their child,” Superintendent Jeff Eakins said. 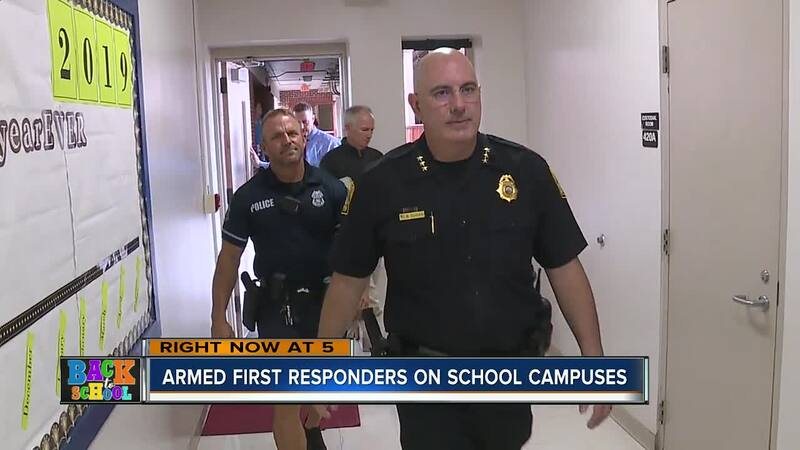 Several agencies worked together to prepare for the first day of school — including the Hillsborough County Sheriff’s Office, the Tampa Police Department and the school district. “I want them [parents] to have confidence in the plan we developed. Your child (is) going to be safe. I’m confident in the plan,” Sheriff Chad Chronister said. Authorities believe they are prepared to respond to any incident on any of the campuses. “We’ve trained for this. We’re hoping we don’t have to do it, but yes we’re prepared to respond as needed,” Tampa Police Chief Brian Dugan said. They encourage the community to help them by reporting suspicious behavior immediately. Gorrie Elementary School teacher Kristin Rhoads does not want her students to feel scared or anxious. “I would give up my life for any of my students,” Rhoads said. Rhoads said it is her own policy to try to make students feel as safe and make it as welcoming as possible. “When my children start school, I want them to be as safe as possible when I’m not with them,” Rhoads said.